I’m not sure I’ll get to the other 5 pages before the new lesson comes up but there’s no pressure to do all eight pages. This new page started with the hand drawn coffee mug that I cut out. 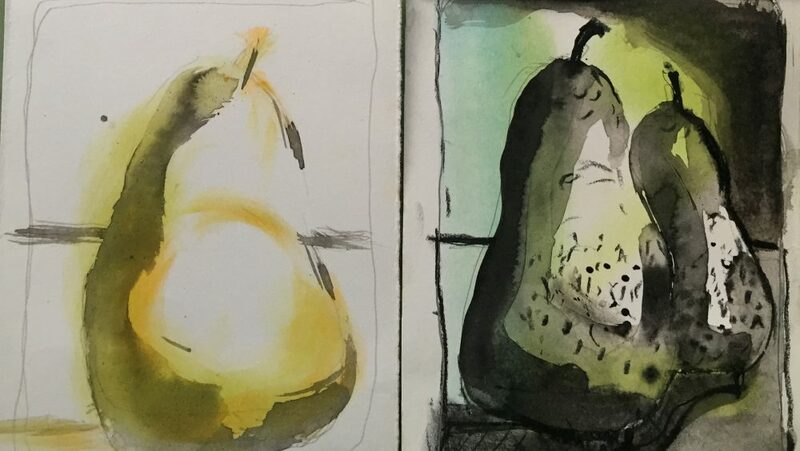 I then added the bowl of fruit and drew a table around it and the mug. I added the cloud shapes and placed the orange circle partially under the cloud to look like the sun was peaking out from the clouds. I added a small bird perched on the edge of the coffee mug and then I added line detail. The last step was to add some colour with watercolour crayons and I drew in some plant material with my pencil crayons. 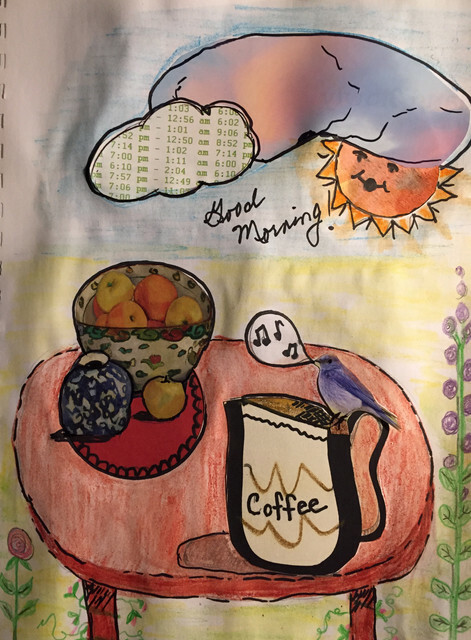 This entry was posted in Art, Art Classes, Photography and tagged 'Good Morning', 2019 Year of the Collage, Carla Sonheim, collage, magazine pictures, paper, pencil crayon, photography, Sharpie, watercolour crayon by Mama Cormier. Bookmark the permalink. Thanks Jill. I wish I could make them simpler. Maybe then I could get to more of them. Thanks Jill. I will give that a try. I thought we were getting another lesson today. I guess it’s every two weeks, so I have time to work on some more of these collages.